Seaspray Villa....St Thomas' Ultimate Luxurious Villa - On the Beach! Escape to the beauty of St. Thomas at Seaspray Villa. 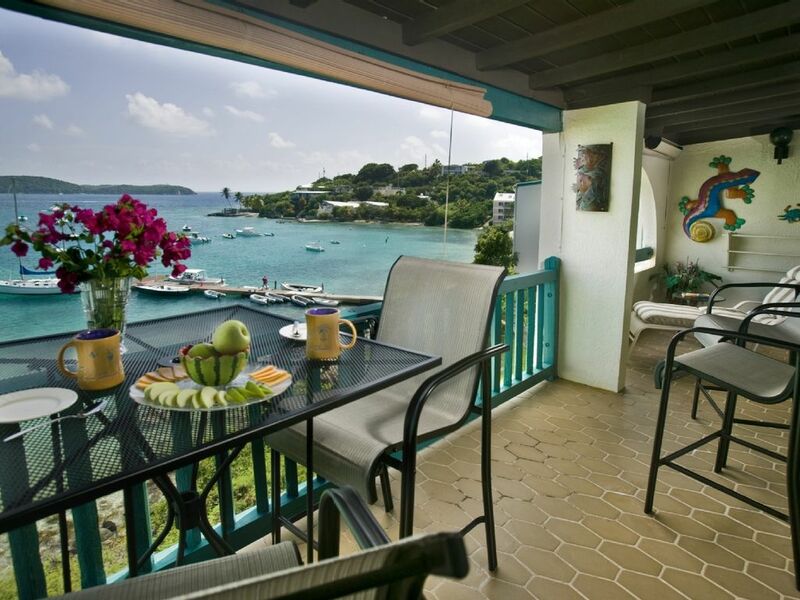 This magnificent two bedroom, two bath condo situated in Cowpet Bay West, an exclusive gated community of two-story buildings on the coveted east end of St. Thomas, USVI. As an upper unit, Seaspray Villa affords exquisite views of Cowpet Bay in the foreground and Great St.James Island in the distance. Seaspray Villa is ideally positioned between the Ritz Carlton Hotel and the St. Thomas Yacht Club - just 500 feet away. Newly renovated, Brand New Gourmet Kitchen, magnificently furnished, Seaspray Villa is waiting for you! Your Exquisite Villa Has it All! : Enjoy breathtaking views from your own private gallery overlooking the bay and turquoise sea. Relax in luxury among tropical island furnishings and new ceramic floors throughout. Wake up in your plush, comfortable bed with the spectacular bay in full view. Feel like eating in? Fully equipped gourmet kitchen features all new appliances. Stroll the beautifully maintained grounds, lushly landscaped with tropical flowers. Enjoy all the membership privileges at the Elysian Beach Resort next door, with tennis courts, fitness center, spa, swimming pool, beach bar and beach shop. For your comfort and entertainment: central air,ceiling fans,cable TV, WIFI, gas grill, washer and dryer, automatic stand-by generator system. This is a no smoking villa. Sit and relax on the wonderful balcony and view the beautiful water of Cowpet Bay. Available at the Elysian Resort next door. Kitchen completely remodeled with the latest Refrigerator, Oven, Stovetop, Dishwasher, sink, cabinets and counters waiting for the Gourmet Chef to utilize! The property manager for Seaspray Villa, is and they are available to provide guidance to a multitude of activities on the island and to make recommendations and reservations for restaurants. They also can to arrange for transportation to and from the airport and to arrange for any special needs. Beautifully decorated , open the sliders to balcony And u have a million dollar view ! My husband and I stayed at the Seaspray Villa last March with our two daughters (3 and 6 years old) and would highly recommend it! We were familiar with the area and St. Thomas, but not this particular condo until this spring and hope to return for another vacation. Nice, bright and clean condo located over the water with an amazing view of the bay, the beach and St Thomas Yacht Club. Janel and Alan were extremely helpful and responsive, especially when dealing with possible weather delays up in New England. We really appreciated their hospitality and professionalism! The condo is well equipped and provides easy access to the beach, pool, Red Hook, grocery stores and other island attractions. Thank you again for sharing your home with us! We've been to St. Thomas each of the last several years and thoroughly enjoyed our 1st stay at Seaspray villa. We've stayed at Cowpet Bay West before and this unit on the water was great, very comfortable, and perfectly suited for our needs. When seeing a complete rainbow from the balcony 5 minutes after arriving, it was a good sign of the rest of our stay. Janel and Gordon were helpful and easy to deal with, including an email follow-up during our stay to make sure everything was good (thanks). We also like the uncrowded, very nice beach right there. When looking for something different to do this trip, per Janel's suggestion we booked the BVI multi-island day sail with New Horizons/Breakaway, definitely the fabulous highlight of this trip (spectacular Baths in Virgin Gorda and beach fun on Jost Van Dyke). Big fans of the Red Hook area for dining and nightlife, although dinner at Oceana in Frenchtown, unbelievable views high-up over downtown at Mafolie restaurant and brunch at Old Stone Farmhouse were well worth the drive (had a car). Look forward to returning and strongly recommend a stay at Seaspray. We stayed in this beautiful bay front villa for almost a glorious week. ( 12/8-12/24). The most gracious and hospitable owners- Alan and Janel Gordon,were a joy to work with.They arranged a car and driver to pick us up from the airport.Ramona was wonderful! Dependable and on time.We gave her our list of dinner reservations the very first day and that was it.The villa is located in a lush,tropical gated community.We were on the second unit.Cool breezes blew in gently from the bay.Beautifully furnished with island decor.All wicker and rattan.Great amenities.Very nice bathrooms.Beach nice but small.However two great restaurants- Sangria's and Caribbean Fish Market. Ask for Mr Big Life at CFM! The beach offers kayaking,SUP,snorkeling( great!) and paddle boats.We went to Bleuwater for dinner at the Ritz one day.Terrible food and service.Very disappointing.The villa is 5 mins away from Red Hook which is full of restaurants- Pesce (excellent) and Fish Tails Bar ( moderate). We took the ferry from Red Hook to St John- try Caribbean Historical Tours and ask for Mr Dawuud.We were SO happy with their service.They came to the condo and picked us up.Don't miss- Magen's Bay,Trunk Bay and brunch at the Old Stone Farmhouse.Ramona- the driver took us everywhere. 1) No need to buy bottled water.The fridge has a built in water filter. 2) Ask the driver to stop at Moe's Fresh Market instead of Food Center- we are still recovering from the high prices at Food Center.The villa has S,P and sugar.Buy coffee beans.They have a coffee bean grinder. 3) It would be nice if the villa had a safe for jewellery and valuables. 4) An i-phone docking station to play music. 5) It would be nice if the TV could be replaced in the second bedroom.The top third of the screen is warped. The DVD remote was not there also.A second cable is needed for the TV's too.We had to switch cables from DVD to TV every time we wanted to watch the news. All in all - I would not stay anywhere else in St Thomas!We really enjoyed our stay.Many thanks to Alan and Janel. snorkeling right out the door. Very nice beach. Close to St John ( our favorite island)-Miss Lucy's Restaurant at Coral Bay is always good. Good restaurant right at the beach and snack bar too. Latitude 18 was fun with music every night and good food. Must have a car as condo is far from airport and walking even nearby is very dangerous. We will rent at Cowpet again. This was our 6th time on St Thomas and 5th time staying at Cowpet.